Bruce Riedel has a great story in the National Interest about the 1962 India-China war and its aftermath. Nitin Pai in the Business Standard on how to better manage immigration into India. The adventures faced in running household surveys in India. I have written earlier about the new world of intense competition for the top two Indian financial products: Nifty and rupee. A big step up in competition against the NSE Nifty options has begun, against a serious and heavyweight rival. Palak Shah, in the Business Standard, describes some interesting developments at the Delhi Stock Exchange. DSE has fumbled before on finding the right partners; perhaps this will set the stage for building DSE into a serious player in the Indian exchange industry. And, see Jeff Glekin on Reuters Breakingviews on India's 3rd stock exchange. How should liberal democracies deal with China and Russia? by Michael Ignatieff. Bo Xilai: power, death and politics by Jamil Anderlini in the Financial Times. If you've wondered why Microsoft faded away in the recent decade, read Microsoft's lost decade by Kurt Eichenwald in Vanity Fair. On this subject, read David Stutz who wrote an open letter when he left Microsoft in 2003. I looked back into 1997 and thought that while parts did not work out, it was a pretty good call: two years before the MS stock price peaked and roughly four years before the cognoscenti understood that Microsoft was a utility in decline. Robert Shiller interprets China's Great Leap Forward as a speculative bubble. China's economy: Apocalypse soon? by Mark McDonald in the IHT. Jayanth Varma on various notions of price. Also see one of my old columns, When marking to market fails. For many decades, India was one of the most protectionist countries in the world. This did great damage to growth and knowledge in India. Tariffs dropped from ridiculous levels to ridiculous levels in the early 1990s and then got stuck there. Yashwant Sinha, as Finance Minister, initiated a remarkable program of cutting the peak rate by five percentage points every year. This worked very well: It steadily got rates down and also gave a roadmap to the domestic industry about what would happen next. In January 2004, Jaswant Singh as Finance Minister announced further cuts to customs duties even though it was not part of the budget. This was criticised in the press as being a `populist' move. I thought it was a big day in India's history: when a Finance Minister feels that trade liberalisation is so important that it cannot wait for February 2005 (since Feb 2004 was to be a vote on account), and when he gets criticised on the grounds that this is populist. While there is more ground to cover on removing barriers to trade in goods (e.g. barriers to trade in agricultural products), by and large, India is doing well on this. The old instinctive protectionism has subsided. Two big areas for work remain. First, all customs duty rates are not yet at zero. And, we have one big gap: the lack of a proper GST, through which we would get to residence-based taxation. The GST on imports would be charged on imports, giving parity between a factory just inside the border and one just outside. And, the zero-rating of exports would mean that the GST burden suffered by a non-resident is refunded to him. The fundamental law of tax policy in this age of globalisation is: You do not tax non-residents. Does this mean that we're in good shape on trade liberalisation? No. The big gaping problem is trade in services. Most of world GDP and India's GDP today is services. Even if we do full free trade on agricultural and non-agricultural goods, that only covers 40% of GDP. The real story of international trade is now in trade in services. The graph puts per capita GDP (in log scale) on the x axis and the measure of barriers to services trade on the y axis. Values of 0 imply perfectly open and values of 100 imply perfectly closed. The regression line shows us that by and large, when countries get richer, they reduce restrictions. The score goes down from roughly 40 (on average) for the poorest countries to roughly 20 (on average) for the richest ones. This shows us the variation of India's restrictions by sub-sectors and by modes. While there is some variation, it is all appallingly bad. If we only got to the conditional mean for the Indian level of per capita GDP, we'd have to get the score from 67.5 to roughly 37.5, which is a big decline. And there is no reason to stop there; we need to eliminate protectionism far beyond what's seen in the conditional mean. To be open to trade in today's world is to be open to trade in services, given the preponderant share of services in GDP. What we are doing is profoundly wrong. We always had an instinctive sense that India does worse on trade in services when compared with trade in goods. The World Bank has made a great contribution by building a comparable database across countries, to give us a concrete sense of where we are and how bad things are. If we want to harness gains from trade in goods, we have to open up to trade in services also. Finance, transportation, and other services are the vital glue that makes trade in goods possible. Our mistakes on services trade liberalisation are holding back our gains from trade in goods also. You may like to also see older blog posts: Globalisation: the glass is half empty, 28 January 2011, and Getting to a liberal trade regime, 15 December 2009. That Maruti has serious labour problems has been known for a long time. But the brutality that unfolded in recent days was out of the world. It was news. When I read about it on Thursday, it seemed to me that Maruti was facing a Tata Motors style situation: of suffering the fixed cost of closing down the existing plant and relocating to a state with better governance. The costs faced in this would be substantial. In that case, a 6 per cent decline of the stock price seemed pretty modest. I watched the small recovery on Friday with surprise. Surely, the cost and complexity of moving out of Manesar is worse than 5%. 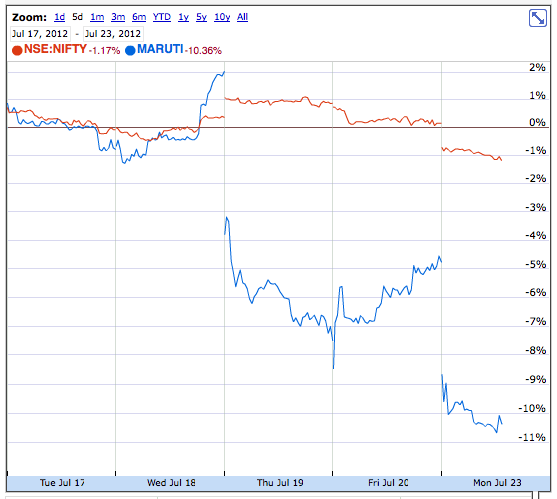 Today, on Monday, the market has shifted from a less sanguine assessment to a 10% drop in the stock price. I wonder if this is new information or a modified judgment about how this will play out. Were the speculators on late Friday evening just wrong, or did some new information break? I would conjecture that poor macroeconomic performance -- low GDP growth and high inflation -- is correlated with greater stress of this nature. With inflation, the logic is straightforward: The worker who had a nominal wage contract finds the need to renegotiate when the value of the rupee changes. This links back to the earlier discussion here on why solving India's inflation crisis is important. Too often, we in India are cavalier about inflation. But we should see inflation as an acid that corrodes all nominal contracts, whether stated or unstated. Renegotiation is costly. Turning to GDP growth, most people that I know seem to think that a couple of per cent of real per capita GDP growth is important for keeping the peace. A lot of people become a lot more unhappy when growth slows. Indian democracy does a pretty good job of containing the angst. There will be no revolution here. But life is substantially easier if the engine of GDP growth is purring. When it stalls -- as it appears to have done in 2012 -- a whole host of social problems erupt. This is a reminder to us about how law and order is the fundamental precondition of civilisation. The most important public good of all, the first claim on the resources of the State including the time and attention of the senior leadership, is police, courts and laws. The entire story of the market economy and high GDP growth can only come about when safety of life and property is guaranteed. The events in Maruti are an important reminder to every investor about the weaknesses of governance in Haryana. November 2005 is the date that Nitish Kumar became the new CM of Bihar. He is widely reputed to have made important progress on improving law and order. At first, the share of Bihar (in all-India under implementation investment) continued to drop. I am sure the changes brought about by Nitish took time; Rome wasn't built in a day. And, after improvements come about, skeptical investors would take some time in making up their minds that conditions are now better. From 2009 onwards, it appears that there is some upward movement. The overall gain seems to be roughly 1 per cent of the all-India total, which is a significant change. There was a big spurt in the share of Haryana in the overall under-implementation investment in India. After that, the numbers have steadily trended down. Is Haryana suffering from a resource curse in terms of proximity to Delhi? In the early decades about independence, India constructed a remarkable legal framework which was strongly pro-trade-union. Few countries have enshrined trade unions into laws on the scale that India has done. In those years, trade unions were primarily led by socialist/communist parties. While we may disagree with their views, there was a fundamental decency about them. Some of the best human beings in India, in the 1950s and 1960s, were communist. Perhaps this coloured our thinking, and encouraged us to respect and empower trade unions strongly in the legal framework which fell into place over the 1960s and the dark days of the 1970s. Today, a hyper-empowered trade union is a potent tool for extortion in the hands of local goons. To solve this problem, it is important to rethink the checks and balances embedded in labour law, which have gone too far in the direction of making trade unions strong. Now that we know that the people in trade unions are most likely local goons, do we want to hyper-empower them through labour law? Three problems afflict formal-sector finance in India today: capital controls, taxation, and financial policy. The most important financial products traded in the formal sector in India -- the stock market index (Nifty) and the exchange rate (the rupee) -- are under enormous pressure as a consequence. One dimension, that has been emphasised in the existing discussions, is the flight to offshore markets. There is another: the trade goes off into underground markets. These come in two kinds. In the field of commodity futures, it appears that important price discovery and liquidity is found on unregulated markets. As an example, in Gujarat, the town of Bhabhar is famous for having a huge oilseeds and edible oil futures market. Babhar is a true market: it has liquidity and discovers the price. The main market where Nifty trades is NSE. But if a customer goes there, he has to suffer the full burden of the securities transaction tax, the charge by the NSE member firm, etc. The dabba operator (`DO') sets himself up in business offering trading services in Nifty futures. Many individuals place buy/sell trades with him. These are meticulously tracked; their profits and losses are calculated and money is exchanged w.r.t. each customer. Through this, the DO is effectively accepting orders -- like an exchange -- and doing daily mark-to-market w.r.t. the customers. On average, the sum total of trades by many customers adds up to zero. So the net exposure of the DO is roughly 0. If an exposure builds up, he might choose to lay off his risk on NSE. The DO charges much less than the NSE member since he does not pay STT and his establishment costs are lower. He is a big man in the community. He can break your bones. So you will not default on him. So he charges less margin. This is another attraction - but it means that some fraction of customers endup entangling with the underworld. The DO will work with black money (i.e. cash). This is another attraction, compared with the all-cheques-and-PAN-numbers world of NSE. The short-term capital gains tax (or worse, ordinary business income treatment of winnings) is then avoided. Bhavesh Shah, reporting from Ahmedabad in DNA, tells us that dabba trading has gotten bigger of late. He also points out that the DOs have been doing some system-building to make their business more efficient. Dabba trading is one response of economic agents to the problems of taxation and improper financial policy. It also happens to a varying degree with trading in India of international underlyings (e.g. crude oil or gold), where capital controls prevent locals from accessing the world market. In summary, when India makes mistakes on three things -- capital controls, taxation and financial policy -- there are two kinds of responses on the part of onshore and offshore users of India-related financial markets. On one hand, users go off to overseas venues. On the other hand, users shift towards informality. In the limit, large scale mistakes on the three fronts will drive the bulk of customers away from the formal sector onshore market venues. RBI, the tax authorities and SEBI will then lord over an insignificant part of the market. We generally know remarkably little about what the people of India feel and think. Politicians have an interest in emphasising ideological biases. Systematic surveys about attitudes and beliefs are generally not taking place. Under these conditions, I find it useful to take whatever scraps of evidence one can get from efforts rooted outside India which are measuring attitudes and beliefs in India. One important institution working on these things is the Pew Research Center which runs the `Pew Global Attitudes Project'. They regularly runs surveys in India, and I have blogged about some of these results before. Some interesting new results were released yesterday. The focus of the study is on gloom in the world economy. With apologies to the authors, I'm going to ignore many elements of that effort, for I found some sub-components which interested me more. Their survey methods seem to be quite good; a sample of 4018 adults spread over a large swathe of India. Are you better off than you were five years ago? The basic engine of high growth is delivering: a lot of people feel they are better off than conditions prevalent five years ago. There is a holdout of roughly a quarter of India which says they are worse off. Can most succeed if they work hard? Do we have a Calvinist ethos? 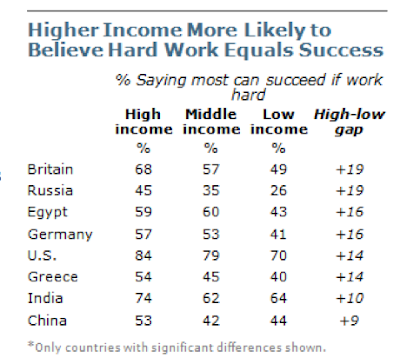 In the overall average, 67 per cent of India believes that most succeed if they work hard. This is behind the US (which is at 77 per cent) and Pakistan (81 per cent) but ahead of all countries in Europe and also China (45 per cent) and Japan (40 per cent). While the overall average is 67 per cent, among the rich we have a much higher number (74 per cent in support). This is next only to the US. This drops off to 64 per cent among the poor. It is interesting that the middle class is what feels the least good about hard work, with 62 per cent. We have a bit more of a Calvinist ethos at the two extremes of the income distribution. Support for the market economy is strong. 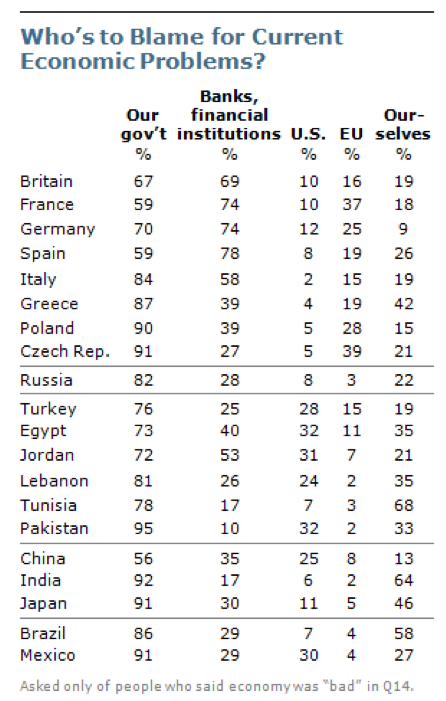 Four large countries are ahead of India on this score: Brazil, China, Germany, the US. The UK is the same as India on this. Is there support for the market economy in these six countries because the outlook for these countries for the next decade is good, or is it the other way around? On an array of questions, the Indian rich are much more optimistic then the poor. 92 per cent of India knows who is at fault: The Indian State. There isn't much anti-finance in India nor is there much anti-US. 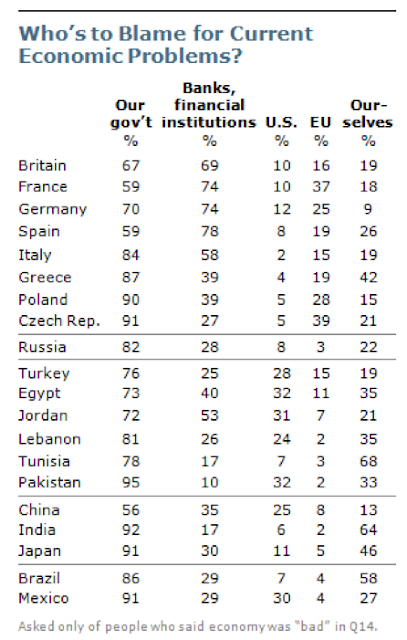 In places like Brazil, 29 per cent blame finance and in places like Pakistan, 32 per cent blame the US. Most of us generally expect that mainstream attitudes in India would be quite left-wing, pro-State, anti-market, etc. The evidence does not seem to support these preconceptions. MANY index funds track the Standard & Poor's 500, but they differ from one another in one major respect: their fees. You'd think that it would be obvious to investors to pick the fund that charges the least. But you'd be wrong. In fact, this truth was anything but obvious to a group of elite students. In an elaborate simulation created by several researchers, many students at Harvard and the Wharton School of the University of Pennsylvania failed to select the lowest-cost index fund for their portfolios, even when they were all but spoon-fed the right answer. There is a problem of consumer protection here. Financial policy cannot and must not be designed on the premise of caveat emptor, that the individuals making choices are the ones best equipped to look out for themselves. The great bulk of financial regulation is about making the world safer for the individuals making those choices. These problems are present with insurance and mutual funds in India, where sales practices and product features have been a scandal for a long time, until C. B. Bhave's SEBI started trying to do something about it. These problems would be present to an even greater degree in a nationwide pension system, where participation has two features: (a) To some extent, it would be involuntary; many people would be pushed into pension system participation without self-selecting themselves as is the case with products such as mutual funds, and (b) Whether participants come into a nationwide pension system through voluntary choice or not, they are likely to be less sophisticated than the `elite students' described above, and thus face even more difficult problems of household financial choice. The key insight of what I term the `second generation pension reforms' is that while we must do defined contribution (DC) pension system so as to keep pension planning away from the balance sheet of the State, we should use public policy decisions about design of the pension system in order to further the goals of consumer protection. One big insight in this is on pricing. Households are seldom able to understand the charges of fund managers. The `elite students' that do fine in comparing an iphone versus an Android phone on features and pricing tend to fumble when it comes to financial products. The clean answer to this is: Standardise fund management into a group of index funds (one for equities, one for government bonds, etc) and procure fund managers through an auction. This has two consequences: economies of scale (a small number of very large AUMs) and low prices (since fund managers compete with each other in an auction). This idea is found in the original Project OASIS report which designed the New Pension System (NPS), it was successfully implemented by PFRDA when the NPS began, it has been used in other places such as the EPFO, the civil service pension of the US (which is named the Thrift Savings Plan (TSP)), etc. For the back story of the NPS, see link and link. To use Raju Chitale's phrase, we are using public procurement to overcome the market failures of the fund industry. 19.1 The PF can fix the Investment Management Fee to be charged to the subscribers subject to a ceiling/cap, as may be prescribed by the Authority from time to time. I disagree. This loses one of the essential features of the NPS. This makes the NPS closer to the fund management products run by mutual funds and insurance companies. To this extent, the value added of NPS is contaminated: why construct the NPS if households can do this same thing through mutual funds? It is important to worry about the political economy of finance. The financial industry will generally tend to achieve dominant mind-share within regulatory agencies. The great unwashed masses, the greatest beneficiaries of sound economic policy, will never have a voice in the policy discourse. In India, our puzzle is that of avoiding both extremes: of socialist stagnation (to use Arvind Virmani's phrase) at one extreme, and crony capitalism at the other. PFRDA runs the risk of veering towards the latter. by Madhavi Pundit and Suyash Rai. On June 27, RBI published its Payment System Vision Document (2012-15). The document shows RBI's vision and mission for the payment system, and specifies the objectives, approaches and courses of action emanating from the same. It is a laudable step taken by RBI to discuss its plans for payments in India. All regulatory activities, such as banking and capital account liberalisation should have vision documents to similarly show the road map. They bring clarity to market participants, and helps everyone plan better. A vision document is an opportunity to think from first principles, and to dream about the payments landscape. The document does not do this sufficiently. Going by the ideas of the vision document, it is difficult to hold RBI accountable to it or to evaluate its role as a regulator, because it is not clear what we should expect the payment system to achieve, say, five years from now. Though the vision itself may be a general, aspirational statement, it should be accompanied by quantifiable goals that can be achieved by Indian payments system (regulator + industry). For example, the regulator can set objectives that by 2015, cash will be x% of transactions, or that cheques will be phased out by 2020. RBI can then, as a regulator, take steps to facilitate the achievement of such goals, with the expectation that other participants will play their part. Such sharp statements are absent in the document. Once a suitably ambitious, but quantifiable, vision for payments has been stated, achieving it requires looking beyond incremental modifications. This brings us to the kind of steps RBI has proposed in the document; the things that it will do to achieve the vision over the next three years. For a vision document, the proposed steps are rather tactical and operational. From this document, it seems RBI is running all payment systems, with incidental cooperation from the private sector. It is difficult to imagine how industry participants should work towards the vision. For an example of how this can be done, contrast the RBI document with the Strategic Review of Innovation in the Payments System, recently released by the Reserve Bank of Australia. Unlike RBI's document, the focus of this document is purely strategic, and on removing barriers that prevent market participants from innovating. The document should clearly state what RBI sees as its role in payment systems - which is above all, that of a regulator - and what it sees as the role of market participants. While the document focuses on the development of certain types of electronic payment systems, certain standards, authorisation methods etc., there are a host of other ways the market could innovate. The document's approach precludes other means by which the same goal of higher electronic payments can be achieved. In payment systems, consumer protection would entail measures that ensure transparency and disclosure by payment providers, so that consumers receive what they are promised. In addition, providers must be subjected to micro-prudential regulations, such as capital requirements, risk management and investment restrictions that ensure their safety and soundness, based on the risks they take. The risk based approach means that small value systems with real-time payments need less regulation than large value systems that hold clients' funds for a certain amount of time. For systemic stability, enhanced regulation and supervision of systemically important payment systems, especially back-end infrastructure, such as RTGS, is required. RBI ought to focus on these regulatory objectives, where it would deliver public goods, rather than take on `private goods' functions that can be handled ably by the market. Systems such as NEFT and ECS, which essentially require capabilities that go beyond a regulator's core competence, can be run well by the private sector, under RBI's regulations. In such systems, competition is of essence. From this perspective, the vision document starts looking less impressive. It is tied to the existing ways of doing things, and intent on incrementally improving them, rather than questioning the existing paradigm. This is unsatisfactory, for a paradigm shift is what India most requires. Perhaps that is why there seems to be a lack of clarity of purpose. For example, RBI talks about investing in cheque systems and electronic systems at the same time. Developing a grid system to replace clearing houses as suggested is expensive. If the objective is to phase out cheques and promote electronic payments, the revamp of the cheque clearing system has no place in the vision document for electronic payments. The emphasis on electronic payments is welcome. It is time for India to become a less-cash society, and ultimately a cash-less society. Myriad inexpensive, safe and useful electronic technologies are available, and more are being developed as we write. Hence the extensive use of cash and other paper-based instruments is not acceptable. They are expensive and inconvenient, and cost the most to those with the least - who pay for using these instruments and also face value erosion due to inflation. More needs to be done to move to electronic payments, and soon. Competition and innovation are both important for this goal. The document talks about the dilemma the regulator faces with regard to pricing. To us, there is no such dilemma. To a large extent, the regulator should not intervene in business decisions such as pricing. In terms of market structure, there are two types of charges in payments - by retail payment providers and by infrastructure providers in the system. At the front end, innovative and cost effective payments products and gateways can develop if there is competition and there is no case for regulatory intervention here. It is a serious issue, and as experience from credit markets would suggest, a cap on pricing usually leads to more exclusion than inclusion. Anti-competitive actions by players can be taken up to the Competition Commission. At the same time, it is important to note that in industries that are network based, there may be a need for monopolies or duopolies in infrastructure provision which require modification of the standard approaches of competition law (example). Under these circumstances, if there is evidence of supernormal profits, there may be role for regulating prices. But even here, price determination should be done transparently, based on a full analysis of costs and reasonable returns, and in consultation with industry participants. For example, in the recent announcement of a cap on merchant discount rate on debit cards, there is no explanation from the regulator for how the amount 0.75 per cent was decided, and what are its costs and benefits to the system. The role for non-banks is conspicuous by its absence in the vision statement. Currently, regulations tie the hands of non-bank payment providers. Take the example of Airtel money, which is a semi-closed mobile wallet. This means money can be transferred to other Airtel customers and transactions can take place with certain merchants, but there is no possibility for cashing out. Vodafone has partnered with a bank, and hence allows cash out from retail points; but these registered points have to be within 30 km of the bank partner. Finally, for large value electronic payments systems, RBI's vision should be to bring them up to world standards and integrated with global systems. Cross-border payments are an important facet of international trade and integration, and this can lead to settlement/ Herstatt risks. RBI should address operational and regulatory issues to minimise these risks. For example, RTGS should be brought as close as possible to a 24 by 7 settlement system to ensure overlaps with corresponding systems in other countries and time zones. Additionally, in light of recent data that shows that the INR is the third most traded emerging market currency, these and other steps should be taken so that the INR becomes an eligible currency for settlement in the Continuous Linked Settlement (CLS) system, alongside the other international currencies already on CLS. In conclusion, it is commendable that RBI has released a payments vision document. Such a document gives an opportunity for us to understand the mind of a government agency, and discuss and debate its priorities and actions. But writing a vision statement is a chance to step away from the familiarity of set ways and ask the big questions. RBI should not squander this opportunity. The Reserve Bank of India has stepped in to regulate the pricing for debit card transactions. The rationale behind this regulatory change seems to be that lower transaction processing fees paid by merchants will lead to an increase in the adoption of retail electronic payments overall. Issuing banks will have to give up interchange revenue in the short run, but increased transactions will make up for lower fees in the long run. An unintended consequence could be that transaction processing gets adversely affected, and the current growth rate of retail electronic payments slows down. The RBI circular was released on June 28, 2012, and the industry is expected to comply from July 1, 2012. Electronic payments are an outcome of the delicate combination of technology and incentives. A card scheme (Mastercard, Visa, etc.) brings four stakeholders together. Issuing banks issue payment cards to their customers, who become cardholders, whereas acquiring banks sign up merchants to accept card payments. The card scheme provides the interconnect between issuing and acquiring banks, so that a merchant can accept a payment from any cardholder. The diagram below shows the relationships between all participants in a payments transaction. The service fee that merchants pays to the acquiring bank for processing transactions is called the merchant discount rate (MDR). The acquiring bank collects the MDR from the merchant and pays an interchange (I) fee to the issuing bank and a network fee (N) to the card scheme. The interchange is usually enabled by the card scheme, which guarantees revenue for the issuing bank. This incentivises the issuing bank to keep issuing more cards, and to spend on marketing and loyalty programs so that cardholders activate the cards and use card payments frequently. The MDR necessarily has to be higher than the interchange and includes the acquirer's processing fee (A), which is used to operate the card processing infrastructure. It is traditionally market determined, and is a contract between the acquiring bank and the merchant, based on the merchant's volumes, risk, chargebacks, infrastructure needs, etc. Debit card transaction volumes are growing much faster than credit card transactions, and if one extrapolates the trend from the RBI electronic payments data, it is expected that debit card transactions will have overtaken credit card transactions by volume. We have a topsy-turvy world, where banks are willing to bear the cost of transactions for cheques and cash, but expect fees when transactions are processed electronically. Given that electronic payments often lead to customers keeping higher balances in their accounts, and savings on cheque processing and cash withdrawal, it would be rational for banks to incentivise electronic payments for customers and merchants alike. Should credit card and debit card transactions have the same pricing? Credit cards are really instruments for lending, whereas debit cards are instruments for making payments. The card transaction model evolved first in the case of credit cards, and was subsequently adopted for debit cards. In the case of credit cards, the interchange fee is used by the issuing bank to fund the cost of credit offered to the customer, and the risk of default, between the time of purchase and the time the customer pays the credit card bill. As a result, in case of a debit card transaction, one would expect (I) to be lower due to absence of credit, (A) to be similar since it is already market determined, and hence, (MDR) to be lower. Large merchants are often able to negotiate a lower (MDR) with acquirers, even lower than (I), implying that (A) is negative. The acquiring bank offers this service to the merchant if the merchant maintains their current account with the acquirer. Clearly, this model is not scalable and does not work for the long tail of small merchants. Should point-of-sale (POS) and e-commerce pricing be different? Today, both credit and debit card transactions have the same MDR - roughly 1.6% for POS transactions, and 2% for e-commerce transactions. E-commerce transactions were once considered riskier with higher rates of fraud, and hence justified higher pricing. Now that two factor authentication is mandatory for internet and mobile transactions, there should be no difference in (I) and (A), and hence in (MDR) for POS vs. e-commerce transactions. Why do regulators step in? The card business is a two-sided platform, where the card issuing and merchant acquiring incentives are managed by card schemes. Consider the case of a new entrant in the card scheme business. The new entrant may want to lower prices to establish market share. However, if the entrant offers a lower (MDR) to merchants by lowering (I), issuers find the proposition unattractive. If the new entrant offers issuers a higher (I), merchants face a higher (MDR), and will be unwilling to accept the product. (A) is already market-decided and offers little opportunity for differentiated pricing. A new entrant can at best, charge a lower (N). These are the kinds of challenges faced by the Government backed National Payments Corporation of India (NPCI) in launching the domestic card scheme, RuPay. The issue of debit card transaction pricing was first highlighted in the public domain in the Report of the Task Force on Aadhaar-enabled unified payment infrastructure. Due to such high barriers to entry, card schemes are routinely examined by Governments, and regulators have stepped in to regulate debit interchange pricing. Regulators have typically capped (I), but in India, RBI has decided to cap (MDR). This is likely to have interesting consequences that are not easy to predict. What will happen on July 1, 2012, when the new pricing kicks in? On July 1, 2012, the MDR cannot exceed 0.75% for transactions up to Rs.2,000, and 1% for other tansactions. If existing contracts remain in place, then issuers are guaranteed to receive (I) (usually 1.1% or higher) and the card scheme is guaranteed to receve (N) (roughly 0.15%). In such a case, (A) becomes negative, and acquirers will lose money on every transaction they process. However, this announcement by RBI is likely to be considered a material adverse change, one expects contracts to be renegotiated. As per the data above, if debit card volumes are Rs.40,000 crore, MDR paid by merchants at 2% is roughly Rs.800 crore. The new regulation effectively means that the merchants are as a group better off by Rs.400 crore on a notional basis on July 1. The acquirers are likely to be inelastic on pricing, which means that it is issuers and card schemes that will have to largely absorb the notional loss - (I) and (N) will have to be reduced in the new regime. Much of this will be absorbed by five large issuers. Over time, as more transactions are processed electronically, banks will save on processing cheques and cash, and instead earn fees from processing electronic transactions. Will the lower pricing due to regulation lead to higher acceptance of debit cards overall? It is clear that merchants who were on the margin, are going to be more likely to accept card payments. It is even likely that merchants will now start demanding debit cards from customers instead of credit cards. At the same time, it is also worth noting that cards are largely accepted by merchants in metros and by e-commerce merchants. India has a network of only 600,000 POS devices and 100,000 ATMs, which is grossly inadequate for a country of our size. (A) is now likely to get fixed due to MDR being capped, and the acquiring business could start seeing stable revenues. This is also likely to lead to an interesting opportunity for the low cost merchant acquiring technologies similar to Square, a number of which are getting ready to launch in India. It could also create an opportunity for NPCI to differentiate itself from established competitors. Overall, the best case scenario is an increased demand for electronic payments with debit cards by merchants and consumers, savings for issuers due to reduced cash and cheque usage, greater acquiring revenues, and more banks entering the acquiring business (PSU Banks are notably absent in the acquiring business). At the very least, one hopes that the oil marketing companies will no longer charge a petrol surcharge fee of 2.5% when paying with a debit card. What are the possible negative consequences of this regulation? If (A) is set too low by the card schemes, the acquiring business will be affected. With no further bargaining power, acquirers may have to focus on cost cutting and holding back new investments. Issuing is unlikely to be affected much given the existing base of 300 Million debit cards, and that banks will continue to issue debit cards for ATM usage. One does expect cash-back schemes, loyalty programs, and various other cardholder incentives for debit products to effecively stop, and cardholder fees to increase. Even with ATM interoperability and pricing, RBI has continues to refine its policy (making interoperability mandatory at first, then free interoperable transactions, then restricting the number of free interoperable transactions to five, white labelled ATM policy, etc.). Similarly, this is likely to be the beginning and not the last word on the matter from the regulator. The policy should be stabilized quickly, since it is consumers who suffer during the experimentation phase. The Oil Marketing Companies have been constantly leveraging technology to launch various initiatives for offering convenience to their consumers For example, some of them are offering the facility for booking refill cylinders 24x7online through their websites as well as through SMS and IVRS. In continuation of their endeavor to leverage technology to achieve more efficiency and improve business processes, Oil Companies have now put in place systems to capture the complete details of customers and track their LPG consumption pattern with an aim to increase transparency in LPG supply chain. With this information, each OMC has created a transparency portal which is hosted on their individual websites. These portals can also be accessed from MOPNG's website. These portals provide complete details of each customer with their consumer numbers, name, address, no. of cylinders supplied, dates of supply as well as the indicative subsidy amount for the cylinders supplied. The portals feature quick search options to find one's distributor,sort information based on consumer numberand consumer name, see thehighest off take consumer orput in a request to surrender one's connection. Logging a complaint is just as easy. Consumers can now even rate the performance of theirdistributors; and this is expected to help the services to improve further. These portals would truly empower the consumers and civil society to verify or seek information under one roof and bring about transparency in a government program where thousands of crores of subsidy is involved. The production, supply, and distribution of Liquified Petroleum Gas (LPG) is governed by the Essential Commodities Act, 1955 and the LPG Control Order, 2000. The LPG Control Order specifies various aspects of LPG distribution in great detail: storage, transport, bottling, packaging, consumer connection, etc. Subsidized LPG is provided largely for domestic use, but institutional use is permitted for Government schools, hospitals, canteens, police stations, etc. Subsidized LPG cylinders are red in colour and contain 14.2kg of LPG, whereas commercial LPG cylinders are purple and contain 19kg of LPG. LPG is supplied to consumers through distributors, who are paid a commission for every cylinder they deliver. Distributors have very thin margins for subsidized LPG, and are given distribution rights by area by the OMC. Margins for commercial LPG are higher, with no restrictiction on distribution. Thus, by design, there is no competition between distributors for subsidized LPG, but commercial LPG is supplied competitively. Almost 90% of the usage in India is domestic, and hence subsidized. A detailed price computation for an LPG cylinder shows that as of June 1, 2012, the consumer pays Rs.399 per cylinder in Delhi, and receives a subsidy of Rs.418 per cylinder. The true subsidy is only Rs.22 per cylinder, and the rest is termed under recovery to OMCs. The Government funds the full subsidy amount of Rs.22, but the under-recovery is funded out of profits of ONGC, OMCs, and partially by the Government. It is also worthwhile to note that LPG is exempt from Excise Duty from Central Government, and often also exempt from VAT. The Report of the Task Force on Direct Transfer of Subsidies on Kerosene, LPG and Fertiliser provides some other interesting figures. There are 12.5 crore LPG connections, consuming 6 cylinders on average. The per-capita consumption of LPG is expected to be roughly 1.5 cylinders annually, leading to a family of four requiring 6 cylinders every year. The total subsidy to consumers in FY09-10 was Rs.16,071 crore, when the per cylinder subsidy was Rs.185. With the current international oil prices being much higher, the total subsidy to the consumers could add up to Rs.50,000 crore this year. The total subsidy to the consumer was Rs.76 per cylinder in FY02-03, and has steadily risen ever since to its current value of Rs.418 per cylinder. The Ministry of Petroleum and Natural Gas, along with the OMCs, have launched transparency portals. Even though there is no restriction on the number of subsidized LPG cylinders that a consumer can order, checks have been put in so that there has to be a gap of at least 21 days between two bookings. The media has been quick to report on the heavy consumption of LPG by politicians and industrialists. The Government expects that the transparency portal will also curb the usage of domestic LPG for commercial purposes. Many are even asking whether LPG should be subsidized at all. Over the next few months, we will learn whether LPG diversion is checked due to transparency portals. However, the launch of other features such as rating of dealers, online complaints, and online booking are certainly going to be beneficial for consumers. The Right to Information Act, 2005 has provisions that require Government to provide data electronically to citizens. Transparency portals are incredibly powerful accountability tools, and should be the first step towards e-Governance for any Ministry or Department. They take existing databases and make them available online for scrutiny, often without requiring major business process re-engineering. Rather than simply make these portals available for browsing online, care should be put in to produce high quality, anonymized, machine-readable datasets that researchers can use for various purposes. Such datasets can provide interesting insight into the microeconomics of households and also macroeconomic trends, when studied over time. India needs a modern finance ministry equipped to meet macroeconomic challenges by Shaji Vikraman in the Economic Times. Editorials in Mint, Wall Street Journal. A Reuters story about fat policemen in Pakistan makes me think about similar questions in India. A dataset of the BMI of policemen would be an interesting one. T. N. Ninan looks back at the dark days of 1975, and the lethality of bad laws and bad law-making. [Also see my writing on this from 2007; but I'm not that optimistic today]. Manas Chakravarty, in Mint, reminds us that State Domestic Product (SDP) data is highly suspect. SDP sits alongside NSSO, ASI, IIP, quarterly GDP, etc. as pillars of the Indian statistical system that inspire profound mistrust. Another bloomer. In the research community, we should be wary of garbage-in-garbage-out projects which stand on these datasets. Mobis Philipose in Mint on clearing corporations. The Survey of India needs to learn how maps are made in today's world. It must either match these capabilities, or contract-out the production of these critical public goods to these firms. The IGIDR Emerging Markets Finance conference: 2011 program, 2012 call for papers. Rohit Viswanath in Mint on RBI reforms. Paul Geitner in the New York Times makes us think about the Right to Vacation Act. We in India are mostly finished with the business of RBI trading in the currency market (link). It was still rather interesting to read Michael Bordo, Owen F. Humpage and Anna J. Schwartz (R.I.P. ), writing on voxEU about the experience of the US, Japan, China and Switzerland on currency trading by the central bank, and the impossible trinity. In recent decades, one of the troubling features of the world has been the retardation of innovation and competition that has been caused by patents in the field of computer technology. One of the tallest figures in law and economics, Richard Posner, has written a devastating ruling which may help precipitate a fresh look at the way patent litigation will go. Deeper reform requires rewriting laws, but judge-made law can help greatly in alleviating the pain. When will we get judges of this quality in India? Fairly frightening news is coming out of China. We are all long China; if China should go bad, it will plunge the whole world into a recession. Rosemary Righter in the Times Literary Supplement. Keith Bradsher says, in the New York Times, that there are fresh concerns about a bizarre scale of manipulation of official statistics, which makes you wonder if the communist party actually believes its own press releases, and is actually flying blind. They are famed for intra-party democracy and debate, but how can that happen without accurate information? And, Craig Tindale describes the incredible levels of stress in that system, which makes India's `functioning anarchy' seem almost idyllic in comparison. Parts of this made me wonder. E.g. he says: the richest 70 members of the government have a net worth of $89.8 billion, an average of over $1B each. This compares to $7.5 billion for the 660 for the US government, an average of $11M each.. How would we fare, in comparison? by Percy S. Mistry, in the Financial Express. A fortnight's visit to China in April, to understand better the progress it has made with public and corporate governance, was startling in its revelations. Having been to China years earlier, to advise the State Commission on Reform of the Economic System (Ti-Gai-Wei) in 1988-1994, it was amazing to realise in retrospect that, over the last two decades, much of the advice given then, had actually been taken and applied. That was in sharp contrast to experience in India. The advice provided there -- e.g. through the Mistry Report and innumerable interactions with MoF and RBI over the years - was applauded by the private financial system for which it was intended (less so by public financial institutions which need to be privatised). But such advice was taken and implemented by MoF and RBI only grudgingly and at the margins of insignificance in terms of impact. What was most strikingly apparent during the visit was the resolution and purposefulness with which China and its institutions are governed. That applies to public institutions and agencies at various levels of central, provincial and municipal governance, state-owned enterprises (SOEs), and the rapidly growing number of private Chinese companies; whether domestically owned or joint ventures with multinationals involving both public and private partners. It was no surprise to confirm that China is much better governed at central, state and municipal levels than India; where public governance is deteriorating by the day. But, that Chinese companies now seem better and more responsibly governed than their Indian counterparts came as a rude shock! The impression of corporate and public governance in China now being well ahead of India (and a lot of what now mistakenly passes for the 'developed world' as well) emerges despite the occurrence of the Bo Xi Lai/Gu Kai Lai affairs that were unfolding at the time. One almost got the sense of careful orchestration and stage management of these 'affairs' by two competing factions for influence within the ruling Politburo and its supporting Standing Committee as the future leadership/management team that takes over in October was being put in place. To be sure the case is invariably made that such resolution and purpose is usually (or can only be) exemplified by a totalitarian state like China, rather than a democratic state like India. After all, China is unhindered by the cumbersome processes of democracy. It has yet to provide many of the personal and human freedoms/rights provided in much of the world and in large emerging countries like India. Yet, despite the correctness of this perception, one cannot help but feel that blaming the Opposition, parliamentary process and democracy, as GoI invariably does routinely (to explain its incompetence and loss of nerve for losing the plot on macroeconomic management), stretches the excuse a bit too far. One wondered after the China visit whether India is the world's largest democracy as it always claims, or whether it is the world's largest abuse of democracy. Abuse: because of the make-up and mind-set of its parliamentarians and political class, and because of the characteristics of the poor and destitute electorate that engenders, propagates and perpetuates at each election such a dysfunctional polity with such destructively counterproductive tendencies, habits and behaviors. China still has to cross the Rubicon of political democratisation and full extension of human rights taken for granted elsewhere. Until it does so, the world is right to be sceptical (if not perturbed) about its inexorable ascendancy into a position of global hegemonic power. But one gets the sense (almost with certainty) that China -- in its own imitable way and in its own time unhurried and unbowed by external pressures -- will develop a 'democratic' or 'quasi-democratic' model that suits its purpose and characteristics. Learning hard lessons from Russia, where it is clear in retrospect that economic and political liberalisation were carried out in the wrong sequence and in the wrong manner, China will do so without destabilising itself in the way that Russia did. The Chinese leadership has no desire to repeat what happened in Russia - i.e. the emergence, after a period of total confusion during the Yeltsin era, of a KGB-controlled/inspired kleptocracy under Putin's leadership. That kleptocracy has now replaced the econo-political apparatus (and power) of the former communist state. Russia's situation has evolved in a manner that, if one thinks about carefully, has some disturbing indirect parallels with 'liberalization' in the Indian case. The Indian public-private kleptocracy (a peculiarly Indian type of PPP) that has emerged in India post-1991 reforms, has not involved the membership of a repressive state intelligence apparatus, as in Russia. India has never had an intelligence apparatus worthy of the name or of any note. The only threat it poses (hopefully but not assuredly) is to Pakistan. That too is an ineffectual, minuscule threat given how poorly Indian intelligence (if that is not an oxymoron) is organised, funded and conducted. But, the Indian kleptocracy that has emerged after 1991 has certainly involved core relationships between established Indian political dynasties and large corporate houses (especially newer ones) that emerged after the Emergency. Those corrosive relationships have become deep-rooted and taken hold in various avatars at central and state levels. At each of these levels they involve different business houses and different political dynasties; some of which have become organised medium-scale businesses in their own right, specialising in unique forms of rent extraction. Taken together, they have resulted in Indian corruption becoming an organised mega-industry post-1972, from the localised handloom cottage industry that it was in the 1952-72 era. That mega-industry has its own codes, institutions, intermediaries, processes and lexicon (peti and khokha). It has resulted in a unique form of crony capitalism, favouring those business houses in India that originated mahacorruption and have since become its principal beneficiaries. Indeed, such corruption has become embedded in the Indian economic system. It is so essential to the 'functioning' of its post-1991 quasi-market, improperly liberalised economy -- where the grant of licenses and inexplicable asymmetries in regulation play such a key role in introducing anti-market distortions and subsequent market failures -- that one now sees the visible damage being done to the functioning of the economy as ham-handed attempts are made to root it out. One could make a good case that, in part, the slowing down of the Indian economy, and the rapid decline in corporate investment following the 2G-scam, is the result not only of macro-economic mismanagement and poor judgement by the FM/MoF, but also because corruption can no longer be relied upon by corporate houses to get things done in the way they once were. If the people (politicians, bureaucrats, regulators and police) a corporate house 'buys' -- through corruption in the political and bureaucratic systems, to retain its strategic and tactical advantages over its competitors in its main markets - can no longer be relied upon to deliver the goods, then what is the point of taking risks that simply cannot be managed? Corruption is not only an Indian phenomenon. It occurs in China; possibly to a greater extent. Its totalitarian regime has not expunged it, although it pretends to have. Petty corruption at lower levels of officialdom is neither as pervasive nor as predatory as it is in India. But at the upper reaches it certainly seems omnipresent. Indeed most Chinese (in the public and private sectors) suspect that members of the Politburo and Standing Committee are engaged in concealed corruption on a scale that might make Indian corruption seem amateurish. Corruption in China arises (and is fuelled) from pervasive state ownership of large public manufacturing, exporting, service and transport enterprises, of public construction companies that have benefitted from massive public spending on infrastructure (of which 10-15% of all contracts is allegedly accounted for by kick-backs), from public ownership of the banking system, and over $3 trillion in reserves that are increasing by 10% annually. On that amount of reserves, over $1-2 billion a day can easily be salted away via accounting errors and omissions and through improperly accounted-for effects of supposed daily exchange rate fluctuations or mark-to-market losses on sovereign bond purchases. Rumored public estimates of proceeds transferred abroad by the top leadership in China invariably range from $100-150 billion over the last five years. If one extrapolates from that figure the proceeds of corruption at lower levels of governance (especially at municipal levels where the granting of land leases is the major source of leakage), figures of around $1 trillion over the last 5-10 years do not appear as outlandish as they might. Certainly the ostentatious wealth displayed by Chinese political and business families abroad lends substance and credence to these estimates, in the same way that the lavish life-styles and expenditures of expatriate Russians in London give credence to its own kleptocratic state. Yet, despite the functioning of both the Chinese and Indian economies being profoundly affected by corruption (of different sorts) the growth and resilience of the Chinese economy does not appear to have been as adversely affected by it as has been the case in India. Instead, quite the reverse! The Chinese economy is displaying extraordinary resilience in the face of externally generated headwinds that are slowing down its dynamic export machine. All the talk about hard and soft landings for the Chinese economy seem moot after the April visit. China has managed to orchestrate a reasonably soft landing with growth slowing to < 8% levels with China switching gradually to a domestic-consumption led rather than export-led growth strategy. But it takes time for a super-tanker the size of China with its $6-7 trillion economy to change course and reverse gears. The single most effective instrument to induce and accelerate such a change - i.e. opening its capital account and floating its currency to result in more rapid market-driven appreciation of the Chinese Yuan (CNY) or Renminbi - has been eschewed as a policy tool to bring about more rapid switching. Over the last two years the strength and resilience of the Chinese economy, in the face of the worst global economic and financial crises the world has experienced in nearly a century, have been remarkable, as reflected in its continued build-up of reserves. These now amount to over $3.2 trillion -- despite the impact of the post-Lehman financial crash of 2008 and the rapid deterioration in the economic circumstances of its two largest export markets: i.e. the US and EU. This massive build-up of surplus capital, which it seems unable to use for its own needs, has led China to open its currency market through administrative measures. The April visit suggested that China is deeply concerned about using exchange rate adjustment as a policy tool, fearing that doing so would destabilise its labour and wage markets. After all the key Chinese imperative to ensure its success as an exporting power has been to manage (manipulate?) its exchange and wage rates so as to import jobs from, and export goods to, the rest of the world for as long as the rest of the world permitted China to get away with it. And, so far, the rest of the world has done that. In the process, China has built up gargantuan reserves which are likely to grow at 10-20% annually even if its trade account comes into balance. Such unprecedented, large global reserves and the way in which they are managed -- perversely reflecting the limitations and dysfunctionality of China's state-owned financial system -- now pose an economic and political threat to the rest of the world. A continued build up reserves at the same rate as before would be intolerable. Consequently, China has arrived at the stage where it has no option but to liberalise its currency market and export capital a little more easily in one way or another. It is choosing to do so through administrative measures such as bilateral CNY swaps rather than via traditional open market measures. These measures lead to a number of interesting interim possibilities before full and traditional capital and currency market liberalisation is undertaken. Until this month, China had focused CNY swaps in local currencies of major emerging market trading partners, and not with developed market partners such as the US and EU. But, a couple of weeks ago, China announced that it would do CNY:JPY swaps with Japan, a developed and large trading partner. Partial capital account liberalisation is also being attempted through gradual opening of the CNY (dim-sum) bond-market in Hong Kong. That market has taken off faster than the Chinese authorities seem comfortable with. What are the implications of the latest Chinese measure to introduce CNY:JPY swaps? They are not likely to be significant immediately as few internationally traded contracts are denominated in either CNY or JPY.The same arrangement for CNY:USD or CNY:EUR would have been more globally significant and led to CNY internationalisation more quickly. However, the question raises some interesting possibilities where China-Japan, China-Asean and Japan-Asean trade is concerned. Triangulation on trade and trade-related long term investment among these three large trading blocs/players (more if one includes Korea and Taiwan) holds out interesting possibilities for the growth of Asian markets in regional currency trades and derivative hedges. Also, Japanese multinationals are major investors in Chinese export production, which is linked to their own export production for global markets, in innumerable and intricate ways. If the CNY:JPY arrangements stabilise the influence of currency fluctuations on such bilateral and pass-through trade then the CNY will benefit and internationalise faster. How rapidly the CNY becomes an international currency like the USD depends initially on how the Asian/Asean markets perceive movements in the CNY and JPY in the short, medium and long term. As a long-term hold, the CNY seems more attractive than the JPY. The Japanese yen is intrinsically a weak currency issued by a very heavily indebted country that is dying slowly demographically, and is a waning global economic power in relative terms. The opposite is the case for China and the CNY. But long-term currency holds are for investors not traders. And China is denying the world full market access to probably the most significant currency numeraire for long-term investment over the next 30 years. In the short and medium term, it is difficult to predict what will happen to the value of the CNY relative to other currencies (especially USD, EUR and JPY) because of administrative intervention. If currency markets were left alone the CNY would appreciate significantly against all three; despite the arguments being made that the CNY has found its real effective equilibrium rate and does not need appreciation. Anyone who believes that does not understand currency markets. Right now the JPY is an international currency that seems to be overvalued, taking Japan's underlying fundamentals and economic prospects into account. Yet it is widely held in global central bank reserves though used to a more limited extent than should be the case for Japan's trade contracts with its various trading partners which, unfortunately, are still denominated more in USD than in JPY. The Chinese authorities could of course internationalise the CNY faster and more efficiently by opening up their capital markets in a phased fashion; making the CNY at first (up to 2016) a partially and then (2017 and beyond) a fully convertible currency. They are doing it instead in a clumsy, administratively burdensome fashion in the belief that going that route will result in more 'control' over the pace of internationalization. A key concern is that this administrative approach (akin to the route that Indian bureaucrats invariably prefer in the bizarre belief that their control results in better outcomes, despite evidence to the contrary) will lead to a series of significant anomalies. They will create distortions of the kind that usually arise with administrative intervention and an aversion to letting markets do what they do best -- i.e. price discovery. Those anomalies and distortions could damage the world at a time when the global economy is still quite fragile. Yet the CNY is heading towards becoming a global currency, perhaps second in importance to the USD over the next 20 years and even more important than the USD thereafter. That process is as inexorable as it is inevitable. Indeed that outcome has been delayed too long. For the world's second largest economy, and its second largest trading economy, to continue having a closed capital account, and a non-convertible currency with a fiat-determined price, is an intolerable eccentricity that has damaged the world and provides an unfair structural advantage to China. Oddly, China has been permitted by the world trading community to play by its own rules to its own advantage (and to the detriment of the rest of the world) for too long by asserting the right to control the most significant price affecting its trade with the rest of the world i.e. the price of its own currency. In an open economy global trading model, world trading patterns, and consequently global investment patterns, as well as global production location and market share, are all supposed to be determined/equilibrated (i.e. with trade, current and capital account surpluses and deficits -- or imbalances -- being sorted out) by markets and not by administrative interventions; with market forces being left to adjust all prices, including currency prices, that affect global trade. When China respects the notion that market prices should determine the prices of all inputs and outputs that make up the cost of its production, but then asserts the right to control a key price (i.e. the price of its currency), which in turn affects the price of imports from China by other countries, it violates a fundamental precept of the open economy global trading model. The sustained violation of that principle for two decades has in large part been responsible for bringing the global economy to its knees, while allowing China to accumulate extreme reserve surpluses that now pose a fundamental political and economic threat to the rest of the world. In the post-Bretton Woods world, China is the most egregiously anomalous case of a country (misusing the developing country argument) becoming as significant as it is in the world economy without being obliged to open its capital account and make its currency convertible. All the other rising economies in the 1960s and 1970s (Germany, Japan and several smaller European economies), 1980s and 1990s (Korea, Singapore, Taiwan, some Asean and most Latin American economies) made their currencies convertible and opened their capital accounts. They did not suffer any of the kind of damage that China claims it would suffer if it did the same. Essentially what China seems to be asserting through its currency management policy is the divine, inalienable right to import jobs from, and export manufactures to, the rest of the world indefinitely by manipulating the price of its currency. That cannot be permitted to continue given the devastating impact such a policy has had on the rest of the world. The CNY must be internationalised sooner rather than later in a market-oriented manner. If that is so for the CNY then what is the future of the INR? As the next largest emerging global economy after China shouldn't the INR follow a similar trajectory? Until last year many astute commentators envisaged the INR taking its own place in the world, following the CNY as an increasingly significant trading currency. They thought at first that the INR would become a littoral/regional (2015-2020) trading currency and later (2020 onwards) a globally significant trading and reserve currency. But the dreadful mess that the UPA-2 coalition and central government have made of the Indian economy over the last 24 months, and the shattering of confidence in India on the part of both domestic and foreign investors, has been an object lesson in confirming that India seems incapable of coping with success for any length of time. India seems instead to be more inured at coping with prolonged failure. It seems to know how to cope with that better attitudinally. Therefore the INR is unlikely to emulate the CNY as a global trading or reserve currency for quite some time yet. Instead the INR is now seen as a temporally if not structurally weak currency that can barely hold its own value, leave alone become a serious trading or reserve currency in the foreseeable future. Contrary to assertions by the FM, PM, RBI and UPA-2 leaders, none of the wounds that India is suffering from, and have inflicted on the INR, have much to do with negative global influences or Europe. At most those factors may have had only a marginal impact on growth and inward investment. The damage done has been mostly self-inflicted. The really devastating impact of MoF/FM misjudgement and malfeasance has been on overall investment and in not relieving mounting supply-side constraints sooner. The FM in particular has played a leading role in convincing investors in India and around the world that India is no longer worth investing in. That impression has been reinforced by aggressive but injudicious posturing by the FM/MoF, goaded by their tax hawks, about the 'losses' India suffers from its DTAs with supposed tax-havens (such as Mauritius) and its contradictory if not absurd positions on applying GAAR retrospectively; and attracting the derision of the world at large. Immense damage has been caused by this failure of judgement, obtuseness and obstinacy in the vindictive vendetta that has been conducted against Vodafone in particular, and foreign firms in general, on the capital gains tax issue. No mention is made at all about the tax gains (direct and indirect) as well as employment gains that have been derived from inward FDI and about the losses that would be incurred if such FDI flows ceased - as they now seem to be doing. If GoI/MoF were so concerned about revenue losses to the exchequer, from FDI that escapes capital gains taxation, the PM and FM would have done better to look more closely at their neighbours in parliament and state legislatures. They could apply more vigorously and impartially laws on assets disproportionate to income. That approach would provide them with a triple-whammy. It would deal holistically with the phenomena of black money, corruption and tax evasion/avoidance, all at the same time. The revenue raising possibilities from that source would make Vodafone look trivial by comparison. Had GoI/MoF done that they would have drawn more effective public attention to the generation of black money which official India is exerting every sinew to evade doing in the most clumsy fashion, knowing that to take serious action on that issue would be to indict virtually the entire political class in the country and bring in to the black money net most corporate leaders as well. The egregious and severely damaging misjudgements on the tax issue, and the mismanagement of the Indian macro- economy since the change of leadership of the Finance Ministry in 2009, have introduced the kind of uncertainty into investment decisions that now make banana-republics and places like Rwanda and Congo seem almost sagacious in comparison with India. How could this have happened? The answers seem obvious in retrospect. The political and bureaucratic leadership of the post-2009 Finance Ministry appears to have been childishly naive and clueless about how finance or economics actually work. All of India, and corporate sycophants dependent on the state-owned banking system for liquidity and long-term loan largesse, have been worshipping a false god -- as we seem to do relentlessly. Look at how we worship supposed corporate titans with feet of clay. It would be funny if it were not so tragic that one needs to screw up a country before one becomes an eligible candidate for that country's Presidency!! Compounding the problem of gross malfeasance in short-selling India as an attractive long-term investment destination, GoI's top leadership appears to have as little clue about what leadership or good governance is all about. The other big beasts in the Cabinet (i.e. the Ministers of Home, Defence and External Affairs) all seem to be in the wrong jobs that play to their weaknesses rather than their strengths. As a consequence, GoI and India have lost all credibility at home and abroad. The impression they convey is of gross incompetence and surprising insouciance. Being clueless seems widespread and endemic. It goes beyond characterising what now seems to be a sorry excuse for a crippled government that needs to be put out of its misery. At the top political leadership level in the UPA, Madam Sonia and Master Rahul Gandhi also appear to have no clue about anything, if the results of recent state elections are to be judged dispassionately. They and their sycophants in the leadership of the Congress Party (simply a monarchy in drag) still believe in an India that should be managed politically by hand-outs, subsidies and populist sops that break the Union and state budgets. They do not yet believe in sustainable long-term development generating growth of >8% for the next few decades based on productive public and private investment of between 30-35% of GDP. Nor do they believe in reducing poverty through productive and meaningful private employment generation rather than on NREGA type income subsidies and hand-outs. They would rather that, at election time, the poor voted for them out of gratitude for hand-outs, than because employment was generated by private companies investing in the economy that could not be visibly attributed directly to them. Their attitudes and supposed 'leadership' make proper macro-economic management by anyone almost impossible. They still do not believe in continuing with structural reforms that widen the distance between the polity and the economy, thus limiting the amount of damage the former can do to the latter through negligence, false ideologies about how the poor can be helped, populism and plain economic ignorance. They do not believe that significant reforms are needed, along with an urgent programme of ambitious privatisation, beginning with Air India, extending to state-owned companies in telecoms, transport, minerals, natural resources, manufacturing, services (such as transport and tourism) and most of all privatising the state-owned financial system. It is through the SOBs that many of the weaknesses of the Indian economy are aggravated and exacerbated. The SOBs are also the conduit for exercising the kind of political influence that results in the kleptocratic quasi-market economy that has emerged in India post-1991; through an inimical but pervasive public-private partnership (PPP) between political dynasties and large business houses. Taken together, the top leaderships in MoF, GoI and UPA -- individually and collectively -- are the PROBLEM, not the solution. Once that diagnosis is accepted, a cure can be found. Until then one can but hope that the next election brings more succour to India than is the case now. What needs to be done urgently is to revive domestic and foreign investment and growth in the Indian economy. Given the rapidly deteriorating state of public finances, a widening current account deficit, a collapsing Indian rupee, and the entrenchment of structural inflation, which it will take prolonged tightness of monetary policy to control, GoI's room for manoeuvre is limited. But there are options to be exercised. The first is to revive confidence in government on the part of domestic and foreign investors. For that to happen, the MoF's obsession with imaginary tax losses has to be dropped in favour of more investor-friendly policies that attract inward foreign investment in large amounts. If that happens, it will spur domestic investment concomitantly. A start can be made by putting the Insurance and Pensions Bills immediately before parliament with GoI doing whatever it must with its allies and opposition parties to get these passed. If the cap on FDI in insurance were lifted from 26% to 49% in the next few months it would result in a significant inflow of FDI. That would spill over through linkages into private corporate capital investment as well as investment in infrastructure. Both are needed urgently to relieve the supply-side bottlenecks that have been built up in the economy over the years and which are now responsible for structural inflation becoming embedded. Similarly, the counterproductive debates and hold-ups on limiting FDI in retail (single and multi-brand) and on moving more urgently with privatising Air-India need to be ended. No national interest is served by imposing constraints and limits in any of these areas. As far as Air India is concerned, it is now obvious to every Indian that continued public investment in that hopeless airline is a waste of public money. It benefits no one, least of all the poor, to run a state-owned airline simply for the personal convenience of the political class. The same could be said for BSNL, MTNL, Coal India and all the SOBs. GoI ought to commit itself to privatising all SOEs by no later than 2025 in a phased manner. State governments need to follow suit rapidly in privatising the plethora of inefficient state-level public enterprises they own as well. Those steps might indicate to the world that GoI/MoF is serious about undoing the immense damage it has done to India and its image as an investment destination since 2009. Unless that is done, with an ambitious far-reaching reform and privatisation agenda which convinces domestic and global investors that GoI really does mean business, then the Indian economy will continue to languish with prolonged sub-par performance. If that happens fiscal performance will worsen, inflation will remain too high, and growth will remain too low. A financial crisis will ensue. The INR will continue to decline in value internally through high inflation, and externally against other currencies, putting at risk and perhaps even reversing all the achievements of the 1991 reforms. It would be a sad legacy for a beleaguered and exhausted PM to leave, with the best of intentions but the worst of performance (and corruption) records, as he exits a stage he has played a lead role on for nearly a decade.